Trump Supreme Court Nominee Brett Kavanaugh was subject to a wringer of testy Senate confirmation hearings last week. The current DC Circuit Court judge has come under fire from Democrats on the Judiciary Committee for his stances against the landmark pro-abortion decision Roe v. Wade, affirmative action and programs for Native Hawaiians, as well as his support for torture. 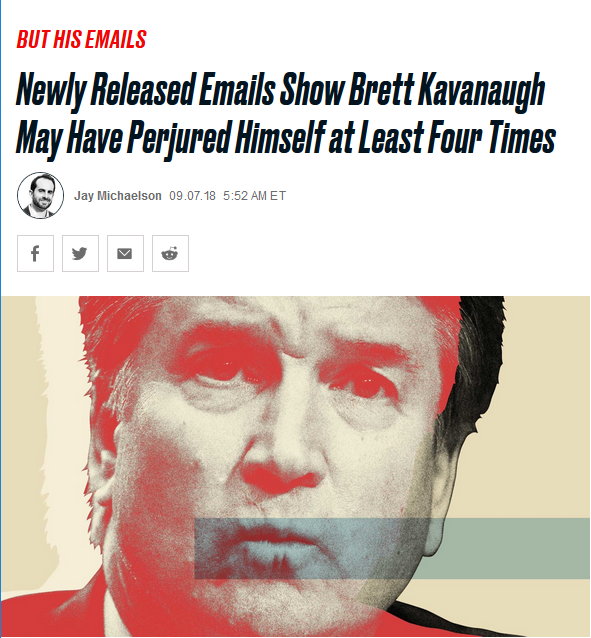 In the 2004 hearing, Kavanaugh also denied under oath that he “personally handled” the nomination of controversial anti-abortionjudge William Pryor to the DC Circuit Court, although emails from 2002 and 2003 say otherwise. Many outlets, such as Slate (9/7/18), Vox (9/6/18, 9/7/18), Daily News (9/6/18), Politico (9/7/19), the Nation (9/10/18), Common Dreams (9/10/18), Newsweek (9/8/18), the Daily Beast (9/7/18), Mic(9/10/18), Media Matters (9/6/18), Rewire (9/10/18) and Salon(9/8/18)—mostly on the liberal or left end of the media spectrum—have addressed the recent perjury allegations against Kavanaugh in depth. By contrast, as of today, establishment outlets like the New York Times, CNN, the Washington Post and NPR have been quite cagey about the issue. 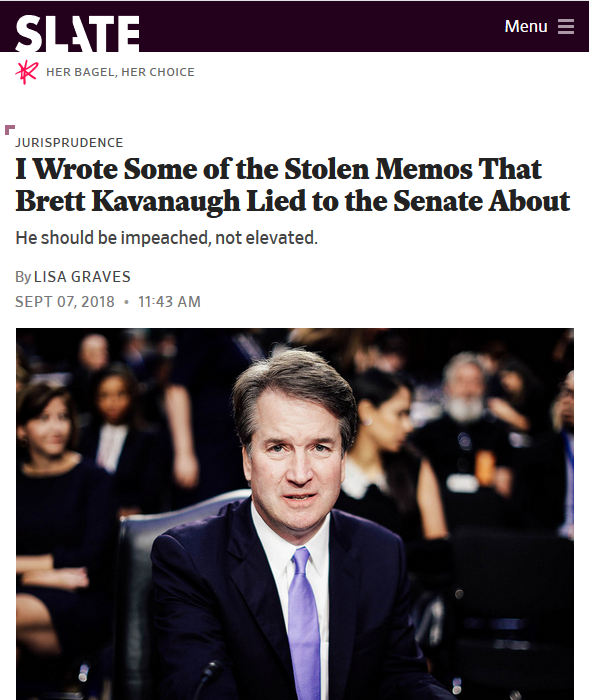 While the Times editorial board (9/7/18) came out against Kavanaugh’s confirmation, they have avoided fully addressing Kavanaugh’s potential perjury charges (although columnist Michelle Goldberg did highlight his lies under oath in an op-ed, and an article by Nicholas Fandos mentioned it in passing). This is odd, considering that the Times (8/20/18) recently looked back at Kavanaugh’s role in pushing for perjury charges in the Starr investigation and has covered the scandal regarding the stolen Democratic documents in the past (3/5/04). On September 7, CNN analyst John Avalon dismissed the hacking allegations by Senator Leahy as “baggage” and “ancient history.” Two days later, Jake Tapper did attempt to address Kavanaugh’s allegations of perjury on CNN (9/9/18), but instead of reporting on the intricacies of the issue, he invited on Republican Sen. Ben Sasse, who obviously defended Kavanaugh. As FAIR associate Sam Husseini pointed out, in a recent NPRinterview (9/10/18) with Ken Starr, Morning Edition host Steve Inskeep declined to press the former independent counsel on Kavanaugh’s perjury allegations. Kavanaugh’s Supreme Court nomination wasn’t even brought up at all in the interview. © 2018 FAIR. All rights reserved.